The ideal Christmas gift for all music lovers. 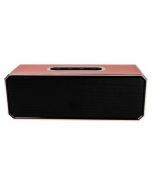 Bring some retro style into your home with this Bluetooth jukebox that offers crystal clear audio quality as well as Bluetooth connectivity, letting you wirelessly stream music from your iPod, MP3 player, tablet or smartphone. An integrated professional CD player and an FM radio function gives you, even more, listening options while a full function remote control lets you control your music even when you're away from the main unit. The jukebox even features colour changing LED lights, great for creating that party atmosphere at home!